Peterborough Panthers owner Ged Rathbone will face no further punishment from the Speedway Control Bureau (SCB). Rathbone attended a hearing last Tuesday (November 7) at which some of his comments relating to the Jack Holder saga were looked into. Rathbone had claimed that British Speedway Promoters’ Association (BSPA) vice-chairman Rob Godfrey advised him to release Panthers number one Holder to race in Poland - something which is against the association’s rules. The SCB released a statement on its findings earlier today and Godfrey will be ordered to attend a further hearing. The SCB statement reads: “A Judicial Inquiry was held in Rugby on Tuesday 7th November 2017 to establish and consider the matter of Mr Ged Rathbone and Mr Rob Godfrey, both of the BSPA, in the release of Jack Holder to compete in a Polish League event against the rules of both the Speedway Control Bureau and the International Speedway League Bureau. 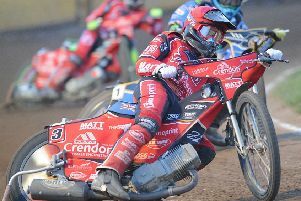 “The panel on behalf of the SCB investigated the public statement by Mr Rathbone that Mr Godfrey had advised him to accept a payment for releasing Jack Holder to ride in Poland, when Mr Holder was contracted to ride for Peterborough. “The findings of this investigation was no corroborating evidence or witness statements to confirm that this was factual. “The panel were also requested to investigate if Mr Godfrey advised Mr Rathbone if he released Jack Holder, he should expect to incur a fine from the SCB at a level substantially less than the payment Mr Rathbone received from the Polish club. “The findings of this investigation was that both parties admitted that a discussion regards the level of fine had taken place. “The panel was of the opinion that the BSPA has now taken to itself too much power and considers that the SCB should be the only body to ensure the rules are upheld. “Decisions taken in this matter were not in the best interest of the sport. “The panel also recommended no further action taken against Mr Rathbone, but the advice given by Mr Godfrey was both ill chosen and in Breach of Speedway Regulation 3.2.7.